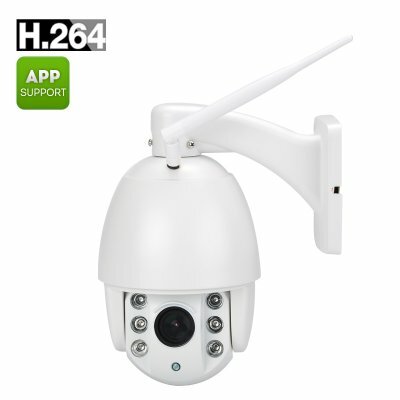 Successfully Added Waterproof Outdoor IP Camera - PTZ, 4 x Zoom, Auto Focus Lens, 60M Night Vision, IP66, Mobile Phone Support to your Shopping Cart. Keep an eye on your property and make sure you are always in the know as to what is going on with the waterproof outdoor IP camera coming with a 4 x zoom, an auto focus lens, 60m night vision and more. This simple IP dome camera is a powerful security tool for your home or office and is sure to give you the peace of mind when traveling. With pan-tilt-zoom functionality, it can rotate to give you a full view of the area and close-ups when needed thanks to the 4 times zoom. The camera can pivot horizontally for 355 degrees and vertically for 90 degrees. The camera can be placed both indoors and outdoors, as it comes with IP66 waterproof rating. This means that the dome camera is dust tight and is also resistant to powerful jets of water. So, feel free to place it outside to keep a look on your back yard. The PTZ dome camera comes with 60m night vision – so, even after things get dark you will have a clear view of the monitored area. Your waterproof dome camera also comes with motion detection. You can choose one specific area in your house or property and be instantly notified should any suspicious activity take place there. It will also make a quick snapshot of the area and send it to you via email. The cam comes with a handy app called XMEye and is compatible with iOS, Android and Windows mobile platforms. The Waterproof Outdoor IP Camera comes with a 12 months warranty, brought to you by the leader in electronic devices as well as wholesale IP cameras..